Tried and true, the Great Ocean Road Touring Route consistently ranks among Australia’s most breathtaking road trips for a reason. 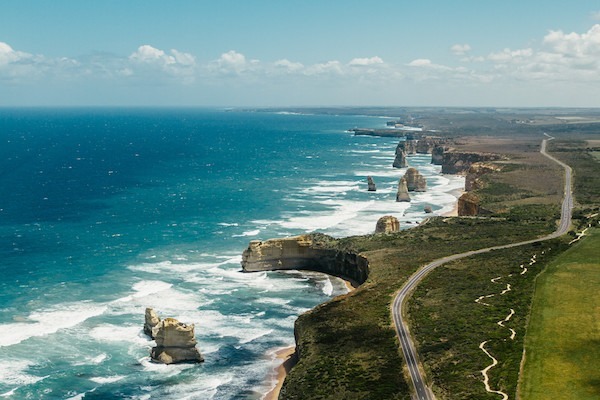 Home to the Twelve Apostles and some of the most iconic views in the country, this drive weaves through rainforests and hugs cliff faces against a backdrop of dramatic coastal panoramas. Your Great Ocean Road adventure starts at Geelong, but before you hit the road, take the time to get a feel for this urban hub that seems to have transformed into a hip centre for culture, arts and gourmet eateries while no-one was looking! Scenic Lorne is nestled in the heartland of the Great Ocean Road. While you can take the one-hour inland route from Geelong, we recommend meandering along the coast and exploring the charming towns along the way – not to mention, those views! If you’re a surf junkie, stop by Torquay’s Jan Juc Beach to catch some spectacular waves before heading into town for a coffee and a nibble at one of the chic cafés. Port Campbell may be a touch too touristy for some, but the majesty of the Twelve Apostles very much justifies the crowds of summertime sightseers. What this attraction lacks in numeric accuracy (only eight of the limestone monoliths still stand) it more than compensates for in natural beauty. As you mosey into maritime town Warrnambool, stop by the Logans Beach Whale Watching platform to see if you can spot a southern right or blue whale out at sea! Middle Island, just off the coast to Warrnambool’s south, is home to a colony of little penguins!